Tibetan video documentarist Dhondup Wangchen concluded his first visit to Washington DC today. The aims of his visit were to thank individuals and organisations who had supported him while imprisoned by China, to testify at a Hearing on Tibet by the Congressional-Executive Commission on China and to speak about the current situation in Tibet. During his 4 day visit, Dhondup Wangchen met with State Department officials, representatives from various human rights NGOs in DC, congressman Jim McGovern and the Representative of His Holiness the Dalai Lama. He testified at the Hearing on Tibet on February 14 in front of Senators Marco Rubio and Steve Daines, congressman Chris Smith and Ted Lieu were also present. Dhondup Wangchen spoke to the Tibetan and Mandarin services of Radio Free Asia and Voice of America and was interviewed by the Washington Post. Dhondup Wangchen was also honoured by Leader Nancy Pelosi at a reception attended by representatives and dignitaries. 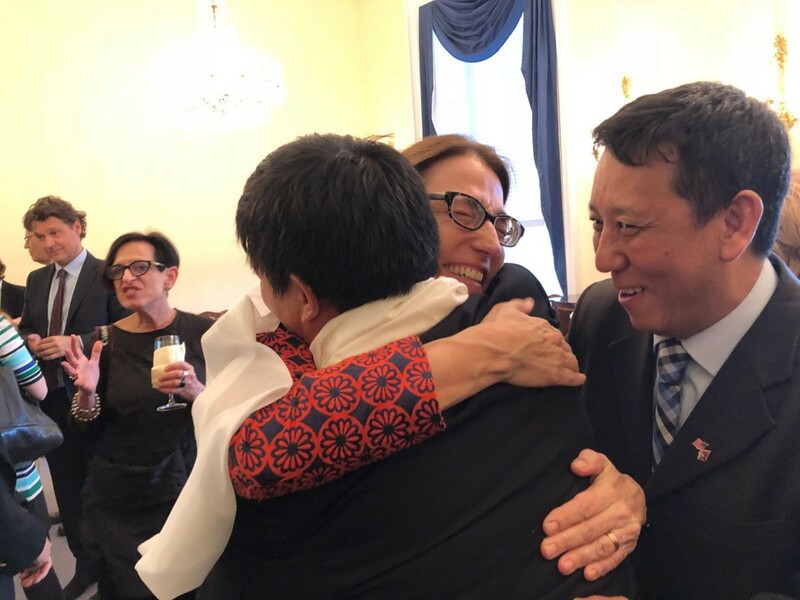 Dhondup Wangchen was hosted in Washington DC by the International Campaign for Tibet and accompanied by his cousin Jamyang Tsultrim, his son Tenzin Norbu and Dechen Pemba. I am very grateful for this opportunity to testify before the Congressional Executive Commission on China on my experiences in Tibet under the Chinese authorities. My name is Dhondup Wangchen. I was born on October 17, 1974 to a family of Tibetan farmers in Bayen which is in the province we call Amdo. In today’s administrative divisions, Bayen is in Tsoshar prefecture, Qinghai province, People’s Republic of China. I arrived in USA on December 25, 2017 and it was the first time in many years that I felt safety and freedom. The reunion with my family in San Francisco was a wonderful moment that I had looked forward to in the past years, with a mixture of anxious joy and the hesitation a man feels who was hindered to be the husband he ought to be for his loving wife; a man who was not given the chance to stand by with fatherly advice to his children in a world full of challenges, and a man denied being the son needed for his aging parents, tormented by the thought that they wouldn’t see each other again in their lifetime. I would like to take this opportunity to thank every individual and organization who has helped to bring me back to my loved ones and who supported me since I was arrested in March 2008. Growing up in the remote village of Khotse in Amdo, 2000 km east of Tibet’s capital Lhasa, I started the discovery of my people’s history with little knowledge but with an insatiable and juvenile curiosity about what life has to offer me. Our family lived a simple life right on the edge of the Tibetan plateau, bordering the Chinese mainland. I was aware of repression in the past. I had lost members on both my mother’s and my father’s sides of my family as a result of China’s atrocities towards Tibetans. However, it wasn’t until I made my journey to Lhasa in the early 1990s as a young adult, that I saw first hand resistance to China’s occupation and political symbols such as the Tibetan national flag. In 1992 when I was 18, I witnessed monks from Ganden Monastery carry out a street protest in Lhasa, some nuns also protested. I saw armed police and military forces quell the protest in a heavy handed manner and detain the monks and nuns. It was also in 1992 that I decided to go to India to see His Holiness the Dalai Lama and receive some education. At that time, there were many Tibetans escaping to India. However, I only stayed a year and returned to Tibet in 1993 where I was involved in activism such as helping former political prisoners. I would like to acknowledge my cousin Jamyang Tsultrim who mentored me in my formative years and who is here at today’s Hearing. In 1996, my good friend Ganden monk Jigme Gyatso – a true Tibetan hero – was arrested on charges related to the 1992 protest. Jamyang Tsultrim was also arrested and they both served prison sentences. I was working in Jamyang Tsultrim’s restaurant in Lhasa, which the authorities threatened to close down as it was the centre of many of our activities. I spent many years involved in various forms of activism and was detained several times. The longest that I was held in detention for was for about 30 days in Lhasa in 2003, but I was never formally charged and was always released. Jamyang Tsultrim fled to exile in 2002, but we kept in close touch and continued to plan and carry out underground activities. We had started a project in 2001 to print and distribute books to Tibetans all over Tibet for free, books related to His Holiness the Dalai Lama’s teachings, Tibetan politics, history and the Dalai Lama’s Middle Way Policy. The books we printed were both in Tibetan and Chinese. By 2004, we were printing books in Xining and Lanzhou, sometimes printing as many as 10,000 copies at a time. Among those who joined me printing and distributing the books; was a monk from Labrang Monastery, Jigme Gyatso (known as Golog Jigme), who I first came to know in 2006 and who would become my helper when making the movie Leaving Fear Behind. This was our first collaboration, but many people were involved whose names I can’t reveal for safety reasons. As the 2008 Olympic Games were fast approaching and it was always being reported in state media, I told Jamyang Tsultrim that I wanted to do something that would have a big and long-term impact and that would reflect the true feelings and wishes of Tibetan people. This was when we first started thinking about making a documentary film from inside Tibet that would later be known as Leaving Fear Behind. I set to work finding collaborators and travelling all over Tibet to interview ordinary Tibetans. Thanks to our activism in the past, we had many contacts and trusted friends we could work with. We would record interviews in isolated places so as not to arouse suspicion and we were always careful to ask whether the interviewees wanted to have their face shown on camera or not. We carried with us DVDs of the Congressional Gold Medal ceremony which showed US President George Bush awarding His Holiness the Dalai Lama in October 2007 – we showed this to many people who became very emotional upon seeing it. My helpers, including Golog Jigme, and I travelled for several months in the cold winter of 2007 recording interviews and sent our footage to Zurich in several batches via trusted friends. Interview after interview, village after village, we recorded a never ending stream of untold stories of past atrocities, complaints against the current discrimination of Tibetans, their frustration and anger about the hypocrisy of the Olympic games and finally their fervent wish to see the Dalai Lama back in Tibet. More people than we could manage lined up to tell their story and witness their unbroken will to fight for truth and right to express their free will. Looking back, I wonder why we hadn’t foreseen their longing for freedom explode some few months later, in the most forceful uprising Tibet had seen since 1959. Our final footage was taken in Xi’an on March 10, 2008, and handed over to a UK born Tibetan who helped to ensure that it reached Zurich. We spent that day together unaware that protests had broken out in Lhasa the same day and would continue over the next days and months all over Tibet. Even though I was aware that I was being followed and was under surveillance, it wasn’t until 26 March 2008 that I was arrested and interrogated by secret police. I was not kept in a police station or prison, but a in hotel and my family was not informed of my whereabouts. The torture started as soon as I was detained. I was forced to sit in the “tiger chair”. For seven days and eight nights I was given no food and was not allowed to fall asleep. On 13 July 2008, I was able to escape from this detention for 24 hours only. In a phone call with Jamyang Tsultrim I learned that they had received all the footage and were in the process of finishing editing the film. It wasn’t long before I was back in detention. Leaving Fear Behind was released and distributed online just before the Olympic Games started in August 2008 by the non-profit Filming for Tibet registered in Zurich. Even though I didn’t know for sure, I was hopeful that everything had gone according to plan. I suspected that the authorities were building their case against me. I was often interrogated and told I had to denounce His Holiness the Dalai Lama and that if I admitted my wrongdoings I would be released. I always refused to do these things. I was shown Leaving Fear Behind while I was in detention in December 2008, a few months after it had been released. I will remember this moment forever. The interrogator wanted to know how I knew the people I had interviewed. And then the showed me the edited film and wanted me to confess. For the first time I watched Leaving Fear Behind, in a Chinese prison! While the interrogator continued to force me to confess my wrongdoings, I just enjoyed in my inside the train scene, the music with the auspicious lyric and felt immensely proud. I thought that even if I received a 10-year sentence it would have been worth making the film. I felt happy for the interviewees who had taken great risks to appear in the film and we had promised them that the film would be seen by the outside world and His Holiness would know about the film as well. So, I was happy that I had been able to keep that promise to the interviewees. In July 2009, I received a visit from Li Dunyong, a Chinese human rights lawyer from Beijing who had been appointed by my sister to represent me. Another lawyer Chang Boyang also came to visit me later and I told them about the maltreatment of political prisoners and about how I had been placed in solitary confinement for 85 days. Even though according to law, I should have had access to a translator, none was made available and I had to communicate with the lawyers in Chinese even though it’s not my first language and my Chinese isn’t very good. A few days after I had spoken to the lawyers, outside authorities came to speak to me in prison and asked me many questions about the lawyers and why they wanted to represent me. The authorities had told the lawyers appointed by my family that they weren’t allowed to defend me and they were pressured and threatened to have their licenses revoked. The authorities told me that I wasn’t allowed to have my own lawyers and had to accept the lawyers that they had appointed. Even though I told them clearly that I didn’t want their lawyers, in reality I had no choice. The authorities then lied to my sister and told her that I had refused all legal representation. I remained in informal detention until I was tried and sentenced on December 28, 2009 to 6 years in prison for “subversion of state power”. The case against me mentioned the projects I had been involved with printing and distributing books as well making Leaving Fear Behind. During my time in various forms of detention, I had to do manual labour which differed depending on where I was. I had been made to do many different tasks such as peeling garlic or stitching military uniforms and was given only two meals a day, which were barely adequate. The day would start at around 6:30am and we had to work until 11pm, we never went outside and I was in constant pain with headaches and hurting arms. I always witnessed a difference in how prisoners and political prisoners were treated. When it came to Tibetan prisoners, we were never allowed to speak Tibetan to each other. On 6 April 2010, I was transferred to Xichuan prison, a labour camp, which operates as an industrial manufacturer under the name of “Qinghai Xifa Water and Electricity Equipment Manufacture Installment Limited Liability Company”. My physical condition declined here and I contracted hepatitis B. Even though doctors did visit prisoners regularly, apart from draining blood from me many times, I never received a diagnosis or any medical treatment. My family members sent me some medicines, but it was only after my release from prison in 2014 that I received proper treatment and was able to spend 15 days in hospital. While in prison, I wrote many letters to my sister and family members and the prison authorities took them, saying they would be sent on. After release, I discovered that none of the letters had arrived. In March 2012, it was discovered that I tried to smuggle a letter to the outside world. This letter was a long appeal to the then Chinese President Hu Jintao and Premier Wen Jiabao, outlining the corrupt prison system and the discrimination that Tibetan prisoners suffer. I was punished, by being placed in solitary confinement for 84 days. In August 2012, I was transferred from Xichuan labour camp to Qinghai Provincial Women’s Prison, the main prison for women. Conditions there were an improvement on Xichuan. I was released from prison on 5 June 2014 very early, at around 4am. Unexpectedly, I was suddenly taken somewhere – to what looked like another prison. I was worried as I thought I was being transferred to another prison and not being released. There were lots of police and authorities there from Labrang, they said they wanted to take me to Labrang, but I told them I wanted to go to Khotse. It all took a long time and I didn’t get to my sister’s home in Khotse until late afternoon that day. Following the release I was always monitored closely and the police would contact me on my phone constantly. I didn’t feel free at all as I was not allowed to contact or meet my friends. Even those friends who were in touch with me or visited me, would be harassed by authorities. I wanted to study and improve my Tibetan and I wanted to work, but in those 3 ½ years I couldn’t do anything. Feeling frustrated and increasingly isolated, I decided that it would be better to escape from the PRC rather than stay there under those circumstances without any freedom. With the help of Jamyang Tsultrim, I made a plan to escape unnoticed from the authorities. It was a long and risky journey to safety, but it was worth it when I arrived in San Francisco on 25 December 2017 and was re-united with my family. While in Tibet, I had some information that the outside world, including that the United States Government, was concerned about my situation. The Swiss, Dutch and the German governments, were also concerned about me. The attention from outside, from civil societies around the world as well as from governments, definitely helped me. This was reflected for example in the way my prison inmates and the prison administration treated me. Though I suffered from being restricted in my communications with my relatives to the effect that I was isolated from the outside world, I was less subject to arbitrary punishments and beatings. I feel your support for cases like me and Tibet in general could be of greater effect if we regularly recall the ground reality. There are thousands of Tibetans like me, actively involved in the struggle. Tibetans in Tibet are not victims but agents of change trying to explore and use every opportunity to fight for a better future. We need support and partnership from the outside world. Every attempt for more freedom or democracy is oppressed by China. It is against the nature of this regime to tolerate freedom and democracy, be it in China, in Tibet and ultimately in the rest of the world. I am very aware about the support the United States Congress and Administration has given to the Tibetan cause, His Holiness the Dalai Lama and the Tibetan people in the past. I know that there is the US Special Coordinator for Tibetan Issues in the State Department, who I would have liked to meet. But I am told no one has been appointed to this position as yet. I am also informed about some important legislations on Tibet that are introduced in the Congress, including the Reciprocal Access to Tibet Act. Pass the resolutions expressing the sense of Congress that the treatment of the Tibetan people should be an important factor in the conduct of United States relations with the People’s Republic of China. My wish is that whatever measures you take that you do it with the strongest possible conviction and in the most forceful and wise manner. As a Tibetan, who tried his best to give a voice to his fellow countrymen, I can assure you the Tibetans in Tibet have not given up the struggle for freedom. I would like to take this opportunity to thank you all sincerely. Previous post: Tibetans have not given up their struggle for freedom!